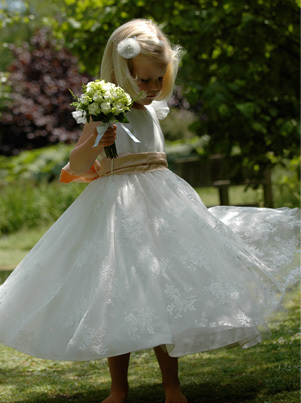 The most romantic flower girl or bridesmaid dress with a gathered circle of lace with a wild silk bodice and a choice of sash colours. Generous petticoat included. Available in ivory and white – see the complete range of sash colours here. Available in stock in Ivory as shown with a choice of sash colours.